The latest information on TTP (Thrombotic Thrombocytopenic Purpura), ITP (Idiopathic Thrombocytopenic Purpura), & Drug-Induced Thrombocytopenia. In this section we introduce platelets themselves. Platelets are the smallest of the three major types of blood cells. Platelets are only about 20% of the diameter of red blood cells. The normal platelet count is 150,000-350,000 per microliter of blood, but since platelets are so small, they make up just a tiny fraction of the blood volume. The principal function of platelets is to prevent bleeding. Red blood cells are the most numerous blood cell, about 5,000,000 per microliter. Red blood cells make up about 40% of our total blood volume, a measure called the hematocrit. Their color is caused by hemoglobin, which accounts for nearly all of the red cell volume. Hemoglobin is the critical protein that transports oxygen from our lungs to the tissues. Red cells are normally shaped as round, biconcave discs. With microscopic examination, they look like a red or orange tire with a thin, almost transparent center. White blood cells are the largest of the blood cells but also the fewest. There are only 5,000 to 10,000 white blood cells per microliter. There are several different types of white cells but all are related to immunity and fighting infection. Platelets are produced in the bone marrow, the same as the red cells and most of the white blood cells. Platelets are produced from very large bone marrow cells called megakaryocytes. 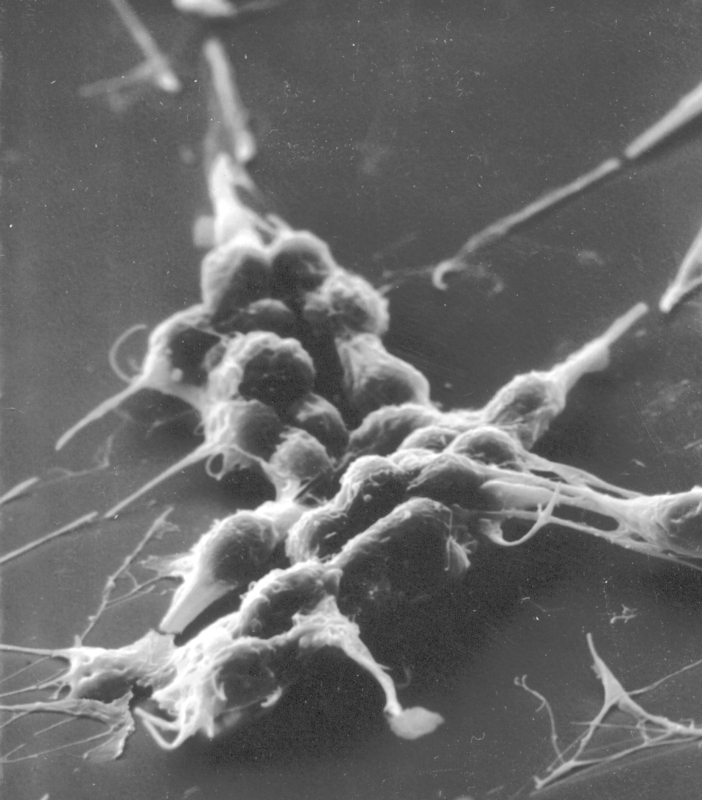 As megakaryocytes develop into giant cells, they undergo a process of fragmentation that results in the release of over 1,000 platelets per megakaryocyte. The dominant hormone controlling megakaryocyte development is thrombopoietin (often abbreviated as TPO). Platelets are actually not true cells but merely circulating fragments of cells. But even though platelets are merely cell fragments, they contain many structures that are critical to stop bleeding. They contain proteins on their surface that allow them to stick to breaks in the blood vessel wall and also to stick to each other. They contain granules that can secrete other proteins required for creating a firm plug to seal blood vessel breaks. Also platelets contain proteins similar to muscle proteins that allow them to change shape when they become sticky. The pictures above show normal platelets on the left. They are shaped like a plate, therefore their name. When platelets are stimulated by a break in the blood vessel wall they change shape as shown in the other three pictures. They become round and extend long filaments. They may even look like an octopus, with long tentacles reaching out to make contact with the broken blood vessel wall or with other platelets. With these long filaments, platelets then form a plug to seal the broken blood vessel. In addition to being the smallest blood cell, platelets are also the lightest. Therefore they are pushed out from the center of flowing blood to the wall of the blood vessel. There they roll along the surface of the vessel wall, which is lined by cells called endothelium. The endothelium is a very special surface, like Teflon, that prevents anything from sticking to it. However when there is an injury or cut, and the endothelial layer is broken, the tough fibers that surround a blood vessel are exposed to the liquid flowing blood. It is the platelets that react first to injury. 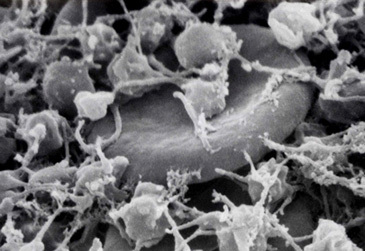 The tough fibers surrounding the vessel wall, like an envelop, attract platelets like a magnet, stimulate the shape change that is shown in the pictures above, and platelets then clump onto these fibers, providing the initial seal to prevent bleeding, the leak of red blood cells and plasma through the vessel injury. The color photograph is a microscopic picture of a drop of blood spread out onto a glass slide. The magnification is not as high as the pictures above, so the platelets seem very small. It can be seen that as the platelets touch the glass, they begin to stick together forming a long string. This illustrates the basic function of platelets, to stick to any foreign surface and then to stick together. 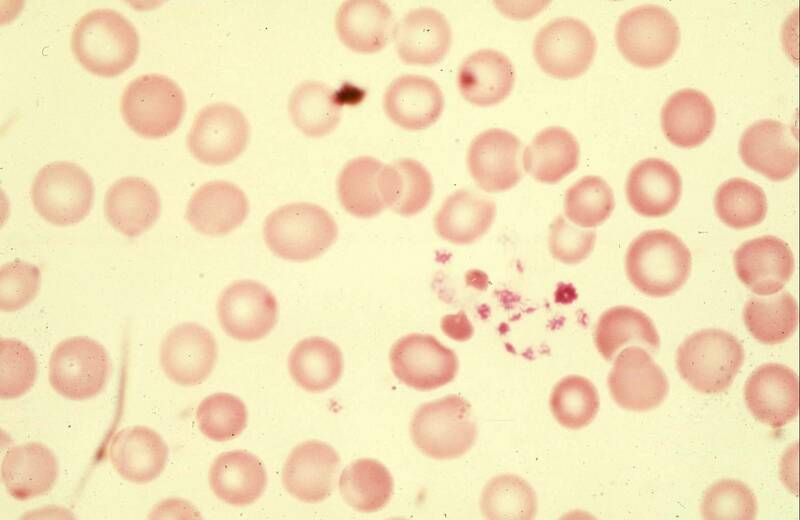 The red blood cells in this picture are normal, with their round shape and their thin center. The most common disorder of platelet function is caused by aspirin. Aspirin blocks one of the steps required for platelets to stick together. This effect of aspirin is what makes it an effective treatment for patients who have disorders of blood clotting or thrombosis. For example, a person coming to an emergency room with severe chest pain and a suspected heart attack is immediately given aspirin. This prevents some of the platelet clumping which can obstruct the blood flow to the heart. Aspirin is an effective medicine to prevent these clots, but it does not totally paralyze the platelet. Therefore many people take daily aspirin and have no problems with bleeding. However aspirin can be potentially dangerous in patients who already have a risk for bleeding, such as boys with hemophilia or patients who have too few platelets and depend on each platelet having full function. Rare conditions result in the bone marrow producing too many platelets, sometimes as many as one million or two million per microliter. In some of these patients, there are increased risks for blood clots, but many patients with these disorders have no problems. Disorders with low platelet counts are called thrombocytopenias, a term derived from an old name for platelets, “thrombocytes”. This name describes the platelets as the cells (“cytes” is a word for cell) that contribute to thrombosis, or blood clotting. The last part of the word, “-penia”, refers to too few cells. Thrombocytopenia is the principal focus of this website. Thrombocytopenia can be caused by failure of the bone marrow to produce normal numbers of platelets. Bone marrow failure has multiple causes. These are not discussed on this website. Thrombocytopenia can also be caused by increased destruction of platelets once they are produced and released into the circulating blood. These disorders are the focus of this website. They are described briefly here and in more detail in their specific sections on this website. Immune Thrombocytopenia (ITP) - This disorder, described in its own section on this website, is caused both by increased platelet destruction and also decreased bone marrow platelet production. These problems are caused by autoantibodies. Antibodies are proteins normally made by a type of white blood cells to react with and defend against foreign materials. For example, antibodies are normally formed to bacteria and viruses, and help with the healing process. Antibodies are normally stimulated by immunization and vaccination, to prevent infections. Antibodies normally react with organ transplants and attempt to reject these transplants. Autoantibodies are abnormal. These occur when antibody-producing cells receive mixed signals, and identify a normal body tissue as foreign and try to reject it. The term, autoantibody, means an antibody that reacts with the person herself, not foreign material. In ITP, platelets are recognized by the immune system as “foreign” cells and autoantibodies are made against platelets. The autoantibodies destroy the platelets rapidly after they are produced. The autoantibodies also react with the bone marrow megakaryocytes and inhibit platelet production. Drug-induced thrombocytopenia (DITP) - This disorder is described in its own section on this website. Almost all medications can cause bad allergic reactions in sensitive people, but these reactions are rare. Most commonly, drugs may cause a red rash in sensitive people. Drugs can also cause serious reactions with blood platelets. In these reactions, drugs stick to the platelet surface, and this combination of the drug bound to the platelet can be recognized by the body as a foreign substance and the body then makes an antibody to the drug-coated platelets, and all platelets can be destroyed. When the drug is stopped, platelet destruction is stopped, and the platelet count returns to normal. But these drug-dependent antibodies can persist for many years, the same way that protective antibodies persist for many years after immunizations. So if the patient takes the drug again, the platelets are coated, the antibody reacts with the platelets and again the platelet count falls immediately to low levels. Therefore recognition of a drug as the cause for thrombocytopenia is critical to avoid any further exposure to that drug. Low platelet counts that occur during pregnancy - This is sometimes called “Gestational thrombocytopenia”. This is described in its own section on this website. It is not a “disorder”. The cause is not known, but the consistent observation is that a few women with uncomplicated pregnancies, perhaps 5%, may have a low platelet count. The platelet count is not very low. Commonly it is only 100,000-150,000/µL, or just below the lower limit of normal. Our opinion is that this is merely a normal adjustment of the platelet count during pregnancy, that the platelet counts of pregnant women, particularly near the end of pregnancy and at the time of delivery, all shift down a little bit. A reason for this is that the plasma volume is increased during pregnancy, and therefore the platelets are simply diluted in the larger volume of plasma. This is the explanation for why the blood hemoglobin concentration is also a little lower during pregnancy. Our opinion is that this is not a health problem and it does not require any additional testing or care. Thrombotic microangiopathies (TMA) - These disorders are the result of abnormal blood clotting in the smallest blood vessels (arterioles, capillaries) throughout all of the body. There are multiple causes of these syndromes. All are uncommon. The most important of these syndromes, thrombotic thrombocytopenic purpura, hemolytic uremic syndrome, drug-induced TMA, and complement-mediated TMA, are described in their own sections on this website. Thrombotic thrombocytopenic purpura (TTP) - In this disorder, described in its own section in this website, platelets are consumed in tiny clots in small blood vessels throughout the body. The cause of TTP is a deficiency of a blood enzyme that helps to prevent platelet clumping and the resulting formation of the tiny blood clots. The enzyme is known by its initials, ADAMTS13. A minor deficiency of ADAMTS13 can occur in many different illnesses and appears to be harmless. A severe deficiency of ADAMTS13 can predispose a person to the development of TTP. A severe deficiency of ADAMTS13 doesn’t itself actually cause TTP because patients can have a complete deficiency and have no health problems for many years. But then, when another condition occurs that increases the risk of blood clotting, such as an infection, surgery, or pregnancy, TTP can become a sudden and severe illness. ADAMTS13 deficiency can be inherited because of a gene mutation, causing lifetime deficiency. Much more commonly ADAMTS13 deficiency can be acquired as a result of an autoantibody. Drug-induced TMA (DITMA)- Just like DITP, drugs can cause TMA by the formation of drug dependent antibodies. Quinine is the most common cause of DITMA related to drug-dependent antibodies. Quinine-induced TMA is typically a very sudden and severe illness with severe kidney injury. DITMA can also be caused by direct drug toxicity. This may also be sudden and severe, as with an illegal drug is used. An example of this is the intravenous injection of the narcotic, Opana (oxymorphone). Other examples of toxic DITMA are from cancer drugs and immunosuppressive drugs used for patients with an organ transplant. Hemolytic uremic syndrome (HUS). This is a TMA syndrome caused by an intestinal infection with a bacteria that secretes a very potent toxin, named Shiga toxin. In the US and Europe, the most common bacteria causing these infections are certain types of E. coli, and the most common type of E. coli is called E. coli O157:H7. E. coli O157:H7 is a common and normal intestinal bacteria in cattle. Therefore eating undercooked beef or contact with cattle can create a risk for HUS. Most cases of HUS are sporadic, just a single person is infected. Sometimes a large dramatic outbreak can occur, related to a restaurant or a contaminated food or water source. 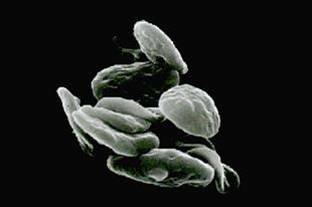 Shiga toxin can cause severe kidney injury. Complement-mediated TMA. This is a recently recognized cause, usually associated with an inherited gene mutation that causes an abnormality of the immune (complement) system. The complement proteins are normal blood proteins that can act as scavengers so our bodies can remove our own damaged cells or destroy foreign cells. If the complement system becomes overactive because of an inherited gene mutation that limits the normal regulation and control, the complement system can damage our own cells. This is what happens in complement-mediated TMA. The most vulnerable target seems to be the kidneys and the most serious problems are kidney injury and failure. In 2011 a new anti-complement drug was approved specifically for this TMA. Its generic name is eculizumab; its trade name is Soliris. It is extremely expensive – the price is over $600,000 per year of treatment. However it is effective when used for the proper patients.